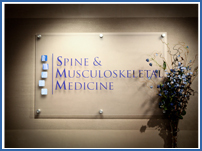 Spine and Musculoskeletal Medicine is a uniquely committed group of individuals trained to focus on your musculoskeletal condition. We are dedicated to providing the highest quality, evidence-based and ethical care through practice excellence at all levels. • Patient care and safety is our priority. • Provide unparalleled, meticulous care at all levels. • Advance innovations in non-operative musculoskeletal care.